Venezuela is one of the most ecologically rich and diverse countries in the world but the pressures of population and the economy threatens many of Venezuela’s natural wonders. However, a few private and non-governmental groups in Venezuela are trying to combine their strengths and expertise in order to ensure that what has happened in so many other parts of the world will not happen in their beautiful and exotic country. Angel-Eco Tours is leading the way and is a prime example of this alliance; their President being the former founder and member of EcoAlianza – uniting the private and public sectors in order to develop and promote ecotourism as a vehicle to preserve Venezuela’s flora and fauna for future tourists and the people of Venezuela. Venezuela is making a concerted effort not to follow the formula of other countries that have decided to promote mass tourism by building large resorts that often threaten or destroy the plant or wildlife that made the destination so unique in the first place. In contrast, Venezuela promotes sustainable tourism, that benefits travelers by giving them a glimpse of a pristine land. Ecotourism also provides the local citizens and indigenous tribes with a way to earn a living by protecting their environment instead of destroying it. Carol Kalahari puts Angel-Eco Tours and EcoAlianza in the spotlight of her Ecotourism Management newsletter. ”The World Tourism Organization” (WTO) recognized this achievement by including the early work of Angel-Eco Tours Inc. in an official document on Sustainable Development of Ecotourism which was a compilation of good practices of Ecotourism. The President of Angel-Eco Tours was the founder of EcoAlianza and Expoecoturismo in Venezuela in the early 2000’s – two organizations that were sadly since “expropriated” by former colleagues, as it were, in recent years. Check out the original document from the WTO pertaining to the early recognition of their work. View PDF. By becoming not just a tourist but an “eco-tourist” to Venezuela, you are helping to provide the necessary funds to preserve and sustain the fragile ecosystems that you will enjoy on your stay in the country. At Angel-Eco Tours we take adventure travel beyond exploring new lands and meeting a physical challenge. By traveling to Venezuela with Angel-Eco Tours, you will leave behind more than just footprints. You will also be contributing to a legacy of preservation. That is what makes traveling to Venezuela with Angel-Eco Tours both an awe- inspiring and personally rewarding experience. You will truly be giving something to the future of Venezuela. Angel-Eco Tours participated in the historic World Ecotourism Summit in Québec City, Canada on May 19-22, 2002. The World Ecotourism Summit was the culmination of the United Nations’ International Year of Ecotourism. Under the aegis of the United Nations Environment Program and the World Tourism Organization, over 1100 delegates from 132 countries around the world gathered to discuss major issues facing ecotourism. All of our travelers make a difference because a percentage of our revenues support special projects that benefit the communities that we visit. Furthermore, we look for revenues to further support these projects through our affiliations with two not for profits, Angel Conservation Corp and Fundación Etnika. Another key element of an Angel-Eco Tours journey is that you will be more than just a passive visitor. Angel-Eco Tours travelers stay in local communities, share their food, and play with them. 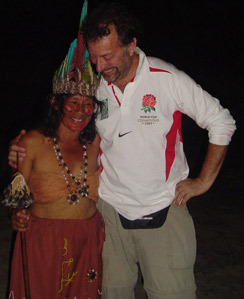 The greatest guide you can have is someone with a profound connection to the land, like the native tribes of Venezuela such as the Pemón, Piaroa and Warao Indians. They will share with you their deep knowledge of the plants, flowers, birds and other wildlife that surround them. They will also share their myths and legends too! That’s the ecotourism experience that Angel-Eco Tours offers you. We invite you to join us in experiencing the ecological wonders of Venezuela and interacting with the country’s native people. Venezuela will captivate your senses and soothe your spirit.